The volcano in Bali, Mount Agung is now erupting. Lava at the peak of Mount Agung Bali. 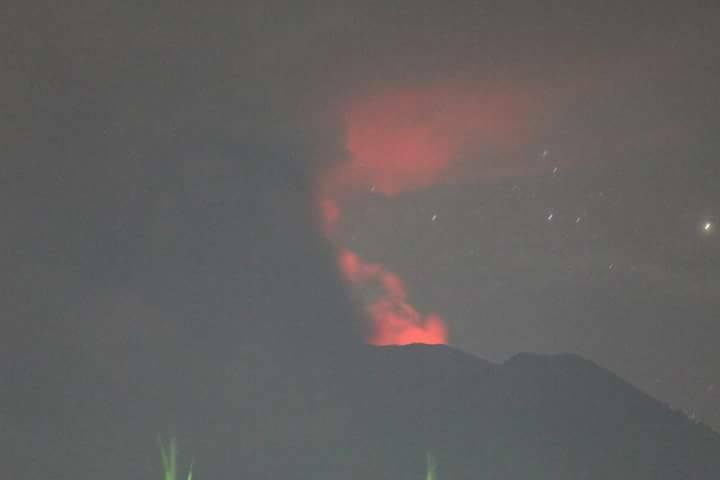 When erupted, a bright red color observed at the peak crater of Mount Agung, Bali, Saturday night. November 25, 2017. The red color is allegedly lava that comes out of the volcano. Head of Volcano Mitigation Division of Volcanology and Geological Hazard Mitigation (PVMBG), I Gede Suantika confirmed that. The bright red color at the peak of Mount Agung is seen at 11:00 pm. It is clearly visible, and it is a real eruption, not a hoax, and is a sign of a bigger eruption, in addition to just a volcanic ash burst. While this is still analyzed by the competent. Photographs circulating in social media about lava flare at the top of the mountain is true. The image looks pretty good. Photos and mountain circumstances are still analyzed. Because most likely red glow on the top of the gunug is lava. Mount Agung erupted, Saturday, November 25, 2017, 5:20 pm. The eruption was accompanied by a cloud of smoke as high as 1.5 kilometers. Volcanic ash was spewed by a mountain as high as 3114 meters from the sea surface. Several hours later, Mount Agung erupted again, at 07.00 pm. Previously, Gunung Agung in Karangasem, Bali, issued a medium pressure crater smoke. Smoke appears gray with a thick intensity and height of 1,000 to 3,000 meters above the top of the crater. The condition was observed from Observation Post Mount Agung, Sunday, November 26, 2017, observation period at 00:00 to 06:00 pm.